/ Nature / Recent developments / Watt on earth are they thinking? Way back in June of this year, I first wrote about plans to install electricity generators at Sunbury Weir and I have to admit that I was rather hoping that the proposal had sunk without trace. Obviously not so. HP Projects Ltd, the company that plans to construct and operate the hydro power at Sunbury, is moving towards submitting detailed plans for the scheme to both Spelthorne and Runnymede borough councils, having already conducted some public consultancy meetings in the area, the most recent of which took place on Saturday at the Riverside Arts Centre in Sunbury. HP Projects, headed up by young entrepreneur James Heather, has already installed a similar scheme – using Archimedean screw generators – at Teddington Weir and is currently working on establishing a similar operation at Boulters’ Lock Weir in Berkshire. The plans for Sunbury involve the installation of four 3.8-metre diameter Archimedes screws on Sunbury Lock Island through which water would be channelled. As the water runs through the concrete tubes encasing the machines, the pressure turns the screws, which are connected to electricity turbines and the resulting power is then fed to surrounding homes and businesses. HP Projects, which is working with the Environment Agency and Galliford Try Infrastructure Ltd on the Sunbury project, estimates that the installation would produce in the region of 500Kw of electricity – enough to provide power to around 800 homes and local businesses. But, it will alter the landscape around the picturesque largely unspoiled lock island and there may be some price to pay in terms of noise from the turbines. What is not yet clear is how much effect modifying the flow of water around Sunbury Weir might have on the ecology of the area. I know my good friends at the Thames Anglers’ Conservancy have specific reservations about the impact such a scheme would have on fish stocks and fish movements in the Thames – and are calling for a thorough study to be conducted before any such plan gets the go-ahead. HP Projects argue that there would be minimal disruption to river fish stocks and say they will donate a proportion of the profits from the Sunbury scheme to set up a community fund to benefit local environmental groups. I suppose you have to put this into the context of a renewable energy future. We have to have something in place for when the oil finally does run out. And maybe hydro-electric power is an option we have to consider. But I still think that there is going to be an awful lot of disruption and loss of local amenity (Sunbury Lock Island is actually Green Belt land) to generate power for just 800 homes. As I understand it, HP Projects are hoping to submit a detailed planning application for the Sunbury operation in 2013. 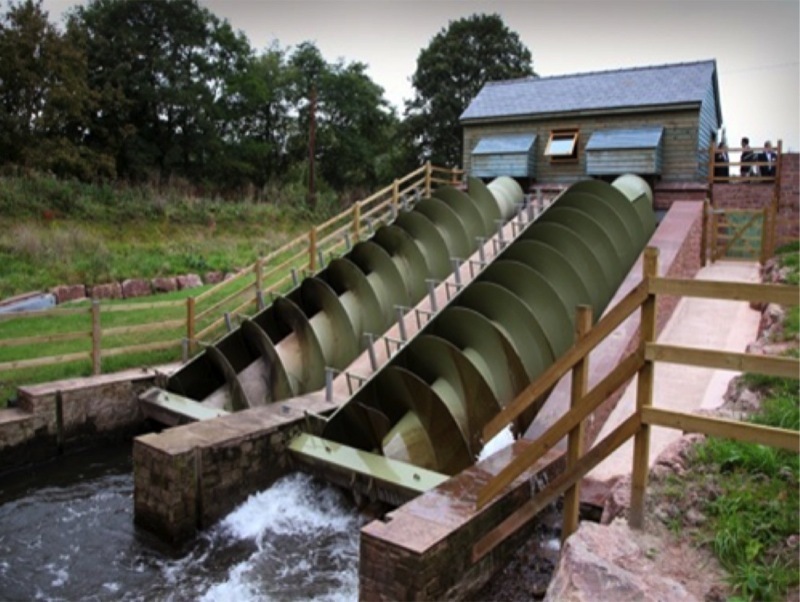 Similar plans to install this kind of Archimedean screw set up are also being considered for eight other sites on the Thames including Bell Weir at Egham. What do you think of the plan? Email me at mort.smith [at] trinitymirror.com or call me on 07760 361 106. Great article on Hydro Mort. One slight error in the 2nd paragraph. ‘has already installed a similar scheme – using Archimedean screw generators – at Teddington Weir’ no Teddington is far from installed. The planning has been dormant for nearly a year now following objections, but that is not the impression HP are giving. There is no track record. This is UNTRUE, he Mr.Heather NOT installed ANY similar schemes ANYWHERE – yet. Surely he would not try to mislead everyone at ANOTHER public meeting?